I finished reading Vanity Fair by William Makepeace Thackeray a week ago and I have been mulling it over ever since. That says something about the book right there. Vanity Fair is Thackeray's comment on society of the day and frailties of human nature in general. It is known as the novel without a hero and I would say without a heroine as well. The book follows the lives of two women. First, Amelia, who is sweet, innocent, gullible, and as dull as ditchwater, and then Becky, who is cunning, clever, out for what she can get and in possession of no morals at all. I have read some reviews where people loved Becky. I have to say I just don't understand. She is selfish, uncaring, a bad mother, deceitful, dishonest, the list just goes on and on. I understand Thackeray's point. He was satirizing society and illustrating the weaknesses of people in general. However, I found the dark portrayal of all the characters and of human nature exhausting. In the beginning, I thought some of them had potential. When Becky threw the dictionary out of the window after leaving the school I was cheering for her. I wanted her to be the determined underdog who made something of herself. Amelia seemed sweet and kind, but she never developed after that. Her constant devotion to her dead and idealized husband drove me crazy. Dobbin seemed like a loyal friend but then he was just a doormat who let Amelia walk all over him. I didn't want them to be perfect and live happily ever after, I just wanted them to be more balanced. In pointing out the vanity of the human condition I feel like Thackeray concentrated totally on human weaknesses and left out the strengths. Now, all of that probably sounds like I hated the book and really, I didn't. It was easy to read, it pulled you into the story and it was witty and clever at times. I wasn't a fan of the omniscient author who chimed in with his opinion frequently but that is just me. And honestly, a book that has me still thinking about the characters days later has something going for it. I feel a bit as if I should be cowering in a corner with my arms over my head while people beat me with their copies of Vanity Fair and tell me that you don't have to like the characters for a book to be good. 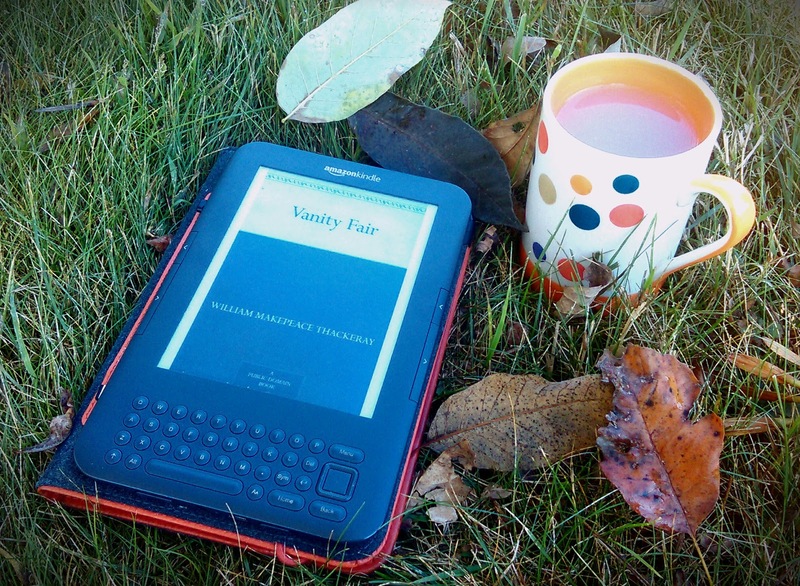 From my meanderings through the internet it seems that Vanity Fair and Becky Sharp are beloved by many. That is fine. This review is not (obviously) a synopsis of the book or an analysis of its message. This review is more my visceral reaction to the book. So, my final verdict? I'm glad I read it but I don't think I will ever read it again. No matter how well done a novel is, I have to feel drawn to the characters for it to go on my list of favorites. I did not feel drawn to a single one of these characters. In fact, at various times I wanted to push them off a cliff, one after another. I tried reading this book once and failed miserably. I might try again some day. I, too, didn't like Becky - nor did I like any of the characters. It became exhausting after a while, and I gave up. But, as I said, I might try again. Never know if I was just not in the mood the first time around. I do think mood has so much to do with our reaction to a book. Maybe all the characters wouldn't drive me so crazy another time. However, I don't think I will ever like Becky! I will say that I've been disappointed in every other book of Thackeray's that I've read. The last one I couldn''t even finish (Pendennis). I didn't dislike Dobbin as much as I did some of the characters. I just got frustrated with his putting his whole life on hold for someone who I felt was taking advantage of him. He was dependable and caring and decent, qualities that were lacking in some of the other characters. But he was a doormat. I know many admire Becky. I just can't. Maybe she got away with so much because she steamrolled over people. You present yourself with enough confidence and present your version of reality with enough insistence and people will believe it. She must have been quite the actress. Thanks for commenting. Vanity Fair does seem to divide people a bit. That is the interesting thing about reading. We all react to books so differently. I think Becky frustrated me. She had potential and she used it so poorly.